Wal-mart – nearing a 12-year breakout ? Walmart's monthly chart - pending breakout ? On Friday, WMT rose 3.57% on 18 ml shares, vs the average of 10 ml shares a day, approaching the critical 1999 high. The biggest change to WMT’s fundamentals has been the resurgence of US comp’s, which had their best quarterly performance since early ’09, when WMT reported in May. WMT is putting pressure on gross margin to drive better pricing and making it up in SG&A and other expenses. No question the economic recovery off the ’08 – ’09 bottom has been spotty and irregular, even though high-end retailers like Coach, Tiffany, Whole Foods have done well, at least until the last few months when COH and TIF have begun to lag. WMT seems to be pushing back against the Dollar Stores and Dollar Tree, and it may be starting to bear fruit, since the stock lagged in ’09 through ’11 when you thought it might outperform, but it looks to be gaining some steam again. The other plus with WMT today is that gas prices have fallen and housing is starting to recover, which are both important to WMT given their demographic. Watch the volume around $70 per share for WMT. In this range-bound market (since March, 2000), it has paid to buy relative weakness and sell relative strength. Maybe WMT will hit $70 and then spend more time consolidating. 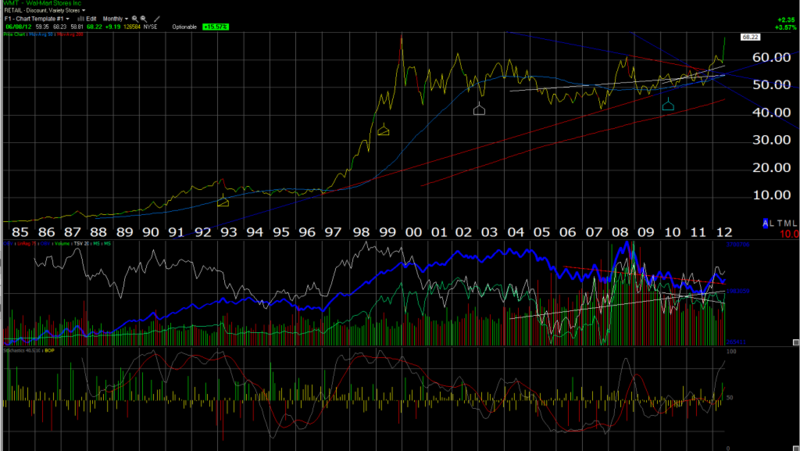 WMT’s valuation isnt extreme, but it isnt as cheap today as it was in the low $50’s. Give it time and let the technicals tell you what is happening. We’ve got more detail on WMT in our earlier post comparing WMT vs Best Buy, published a few weeks ago. We bought a little more Best Buy late last week, and some WMT on Friday. WMT we will sit on, Best Buy might be more of short-term trade here depending what we hear out of Mike Mikan, etc.